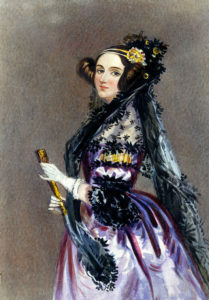 Ada Lovelace worked on Charles Babbage’s Analytical Engine and created the first algorithm to be carried out be a computer of its type. When it comes to technological innovations, women have always been at the forefront. Ada Lovelace, the daughter of poet Lord Byron, is considered to be the world’s first computer programmer for recognizing that a computer could have applications past simple calculations back in the first part of the 19th century. During World War II, it was largely female engineers who pioneered the budding field of computer programming. The recent film “Hidden Figures” highlights the African American women who played a crucial role at NASA during the Space Race. This legacy, though, has largely been forgotten as the number of women in tech fields has dwindled. According to research by Accenture and Girls Who Code, in 2016, women received only 18 percent of undergraduate computer science degrees and held only 26 percent of computing jobs. Consequently, young women interested in STEM fields do not have role models to look up to, as the media largely portrays the “nerdy” coder as a white male (see the show “Silicon Valley.”) Sadly, this stereotype reflects the reality that Silicon Valley lacks diversity in gender, race and other metrics. Since its origins, women have played an important role in VR development (VRScout has a roundup of some of the field’s pioneers.) 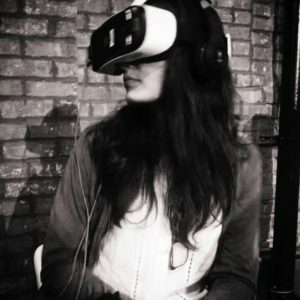 Now, as VR continues to grow – it’s expected to be a $150 billion industry by 2020 – women are working across the industry as founders and heads, coders, engineers and digital artists as well as in other creative, technical and management jobs. The work of these women is documented through the organization Women in Virtual Reality. On the entertainment side, one woman who stands out is Karen Dufilho, who was part of the team that made “Pearl,” the first VR film nominated for an Academy Award. Dufilho is the executive producer at Google ATAP (Advanced Technology and Projects) and founder of house of k, a consulting business focused around new technology. At Empathetic Media, we encourage centering women not only in the stories we tell, but also in how our company is structured. Project manager Katharina Finger has a background in international project management, strategic marketing and administration for companies including Siemens, AG and Aston Martin Lagonda. She is more interested in the topic and space of VR and AR than the tech itself, and is focused on their applications for mobile devices. One of the biggest opportunities of having women in VR is the diversity of stories they tell. In an article for Bust, Daphne Stanford wrote about why it’s important to have women deciding the direction of VR pieces. One recent project we created that centered women’s experiences is “Life In Gawair,” which explores how climate change is causing thousands of Bangladeshis to flee from rural lowland areas to seek opportunities in the urban slums of Dhaka, the country’s sprawling capital. In partnership with the European Journalism Centre and the Zeit Online, Empathetic Media takes you through Gawair’s informal settlements. The project uses 360-degree video, 3D scanning and comics journalism to show the daily struggles of Gawair’s residents to build a life for themselves and secure an education – and better future – for their children. Much of the piece focuses on Rina, who works seven days a week in a garment factory. Thanks to the Maria Christina Foundation, an NGO focused on helping communities in Gawair, her kids have the opportunity to go to school. They live in a tiny room and share the same bed. We wanted to highlight that problems like child labor, violence and underage marriages are common in the slums, but that schools empower girls and provide them with opportunities that can take them one step closer to independence and financial security. Across the VR industry, Finger said that the embryonic nature of the field provides a space not only to highlight important stories about women’s issues, but to have women tell them. “I think and hope VR/AR is a fresh,” she said. “Many people need to start learning from scratch and VR or AR developers are more in demand than ever…this is the chance for a new beginning in terms of gender equality”.